Brad Bird once again brings human characters to life with the help of Pixar Animated Studios. Humans seldom appear in Pixar films; the animation wizards more often consider the secret lives of non-humans (toys, bugs, monsters, cars, fish, robots, etc.). However, Bird’s The Incredibles from 2004 was exceptional not only for its vivid rendering of comic book action and its innovative take on superheroes, which anticipated many of the themes that prevailed in the genre over the subsequent decade-and-a-half since its release, but how every plot development was drawn from his human characters, their flaws, fears, insecurities, obsessions, and emotional bonds. 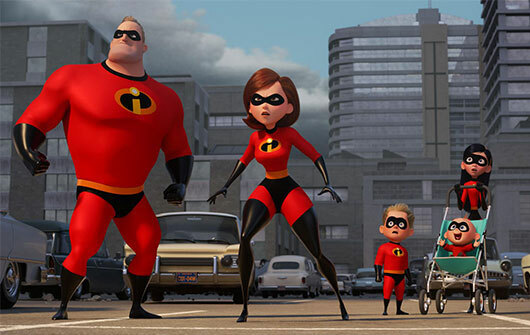 The same is true of the long-awaited Incredibles 2, a dazzling, deliriously entertaining sequel that adds further layers onto most of its characters, while using the past fourteen years’ worth of technological advancements in animation to its advantage. 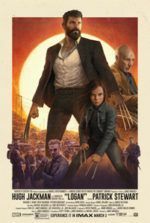 Indeed, this is a beautiful looking film, and it demonstrates, through its breathlessly conceived action sequences and limitless stylization, that superheroes began as cartoons and perhaps should have remained cartoons. The first question that demands an answer is this: Why did it take so long for Pixar to make a sequel to one of their most beloved titles? Fourteen years is a long time. And, for the most part, Pixar sequels have had the same affliction of sequelitis that plagues most Hollywood follow-ups. With the exception of Toy Story 3 (2010), a film that bettered both of its predecessors, most of the studio’s second or third go-rounds have somewhat failed to live up their originals, even while being solid efforts in almost every case. 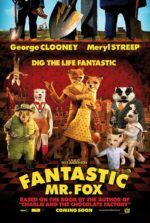 But whereas no one asked for sequels to Monsters, Inc. (2001) or Finding Nemo (2003), and Pixar nonetheless turned out respectable films, audiences have clamored for another entry in Bird’s franchise. The writer-director, ever the self-declared auteur, labored over his story and the details before committing to the film, a vast departure from the otherwise community mentality that drives most Pixar efforts. Before Bird would commit to another venture into his world of 1960s iconography, stylization, spy-isms, and themes of individuality and family values, he wanted to test his directing chops in live-action. Bird’s output away from Pixar became just as indicative of his preferred styles and themes. His earlier debut film, the iconic and somehow still underseen The Iron Giant (1999), contained a 1950s aesthetic and critiqued the fear-based value system that fueled Cold War paranoia and the arms race. 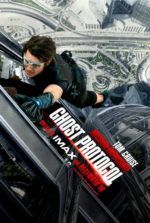 His first live-action film, Mission: Impossible – Ghost Protocol (2011), found Bird exploring spy territory and once more using a 1960s source, this time a television show, to deliver a perfectly realized and revitalizing entry in the Tom Cruise franchise. He followed it with Tomorrowland (2015), another nostalgia trip, to celebrate the era of classic Disney in a period when scientific possibilities seemed limitless and the U.S. was still willing to explore the unknown, although this one was far less entertaining. Bird finally committed to another Pixar film, his first since Ratatouille in 2007, and it was the most anticipated sequel in Pixar’s inventory of beloved characters. Sure, Monsters University was fun and Finding Dory was cute, but those were less interesting than the prospect of a sequel to The Incredibles—a film that fans could agree needed a sequel. Incredibles 2 is different from other Pixar sequels. It picks up at the moment the original left off, with the mole-man like Underminer arriving in the city, robbing banks from his tunnels below. Superhero activity remains illegal, meaning the Parrs’ failed attempts to stop the attack only fuels the arguments against legalizing superheroism. After all, when Bob, aka Mr. Incredible (Craig T. Nelson), the super-strong and impervious type, attempts to stop the Underminer’s high-powered drill vehicle with the help of his family, there’s no end of property damage. The opportunity affords Bob and Helen, aka Elastigirl (Holly Hunter), a chance to practice superheroing with their children: the angsty teen Violet (Sarah Vowell), with her disappearing act and shield-making; the rambunctious and speedy Dash (Huck Millner); and baby Jack-Jack (Elie Fucile), whose powers include everything from teleportation to laser-eyes to flaming-on to body-morphing. But given the level of destruction extolled on the city, the government would rather just let villains do their thing and pay for the consequences than deal with the ramifications of a super-fight. Not everyone agrees. It’s a perception issue, argues Winston Deavor (Bob Odenkirk) and his sister Evelyn (Catherine Keener), a couple of multi-millionaire siblings with a lifelong affinity for supers. Winston understands marketing spin and offers to use Elastigirl as part of a campaign to make the public rethink their narrow stance on superheroes. 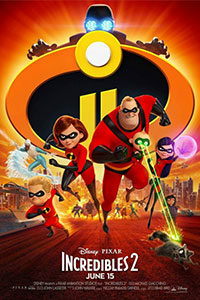 They suggest that the public sees only the aftermath of their super-efforts, the collateral and infrastructural damage, but if they give a body-mounted camera to Elastigirl, who statistically has less of a propensity for destruction than the comparatively clumsy Bob, together they can reframe the public’s views on superheroes. Along with the human ice maker Frozone (Samuel L. Jackson), the Parr adults agree to the Deavors’ plan, and Elastigirl becomes the new face of the pro-superhero campaign. She’s also joined by a fun group of new heroes—the portal-slinging Voyd, the owl-like Screech, the fire-vomiting Reflux, and so on. In the meantime, Bird introduces germane issues from media spin to female empowerment into Incredibles 2, as Helen takes center-stage and bonds with Evelyn over their mutual observance of the otherwise boy’s club mentality regarding superheroes. While Elastigirl stops runaway trains for the camera, Mr. Incredible plays Mr. Mom at home, jealous that his wife gets the spotlight. Bob helps Dash with this math homework. He (mis)manages a romantic crisis with Violet (their government handler, Dicker (Jonathan Banks), inadvertently wiped all memory of Violet from the mind of the boy she likes). 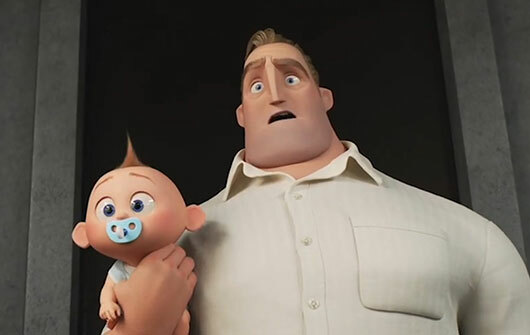 And he tries to contain the emergence of Jack-Jack’s powers, losing no end of sleep in the process. Bob quickly realizes that he has undervalued Helen, and that “Parenting, when done right, can be an act of heroism”—a bit of wisdom delivered by their costume designer Edna Mode (voiced by Bird himself), who helps by making a super-suit to manage the multi-gifted baby. The story’s basic setup provides a dated look at gender roles that, appropriately, borrows a strain from Mr. Mom (1983), complete with an exhausted father realizing far too late that parenting requires inhuman endurance and patience. Bird’s theme of Bob finally being involved with his family is mirrored by Elastigirl’s fight against the Screenslaver, a new villain who uses kaleidoscopic hypnotizing patterns to control anyone he wants—all in protest against our omnipresent screens: smartphones, televisions, tablets, and computers that keep us apart when they should bring us together. Once again, Bird immerses us in his retro-styled, 1960s world of black-and-white televisions, vintage colors, and nuclear family tropes, contrasted by slick, fantastic vehicles that nonetheless have the throwback design of Sean Connery-era James Bond futurism. Michael Giacchino’s score, also evocative of that Ian Fleming series, breezes along and maintains the film’s brisk pace. Of course, Pixar’s superior animation is immersive and atmospheric. The progress made by the studio in terms of character design, realistic features, and movements is staggering, while never reaching too far beyond the look of the characters in the original (a little more realistic skin tone, a few more wrinkles under the eyes). Best of all, the action sequences are downright thrilling. Animation has a way of immersing the viewer better than today’s CGI-heavy, so-called live-action superhero fare. With titles from the MCU, for instance, some part of the viewer remains aware of two separate worlds—the competing tangible and intangible—that are never reconciled or forgotten in the viewer’s unconscious mind. With animation, however, the possibilities are limitless. No matter how out-there or elaborate the action sequence, it all takes place in the same animated world, and the viewer remains completely immersed, entranced, and delighted. The natural question to ask with any sequel—Is it as good as the original?—is a difficult question to answer, because it depends on what you value about the first one: the family dynamic, the 1960s aesthetics, the wowing superhero action, or all of the above in equal measures. Suffice it to say, Bird’s sequel remains every bit as thoughtful and three-dimensional as The Incredibles. The animation is notably superior, while the character arcs are perhaps less dramatic or significant than the first, but only moderately so. Regardless, Pixar delivers a marvelous film, a high point in the history of the studio’s sequels or otherwise. It’s everything we’ve waited for and wanted in a follow-up to Bird’s 2004 original, instantly making the fourteen-year interim seem like a blip in animation history. With thoughtful observations about family and our culture, Bird simultaneously delivers one of the best superhero films, period. Here’s hoping it doesn’t take half as long for part three.